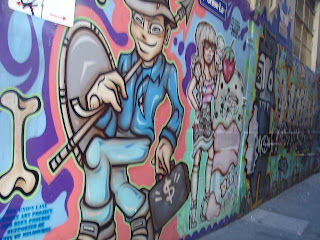 Living in a Picture Book: Melbourne - the message - art on the streets! Figuratively, it is the Writing on the Wall. Who is looking. who is listening? 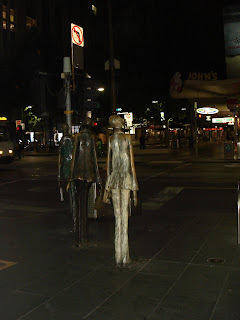 To Melbourne's credit, certain areas are set aside for the art of protest and its message. 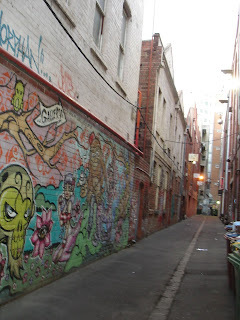 The alleyways of Melbourne CBD are alive with it. St Kilda alleys and rooftops also resonate the warnings. Melbourne Artist, Tigre, viewed Melbourne's response to street art as enlightened compared, interestingly, to New York, where zero tolerance is the rule. No street art lasted longer than maybe an hour before the whitewash brigade obliterated its message. Till, that is, an entrepreneur bought up an apartment building, opened it to the artists and funded its existence with funky retail outlets. 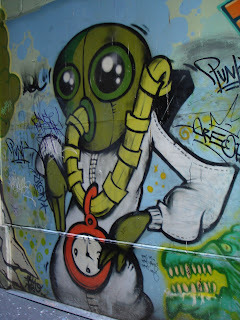 AMelbourne's street art targets irresponsible affluence, greed and disregard for environment. all things with a price tag that is not nice or 'convenient' but is indiscriminate in who it punishes. Tip the natural balance and everything falls into the refuse heap - Soylent Green anyone? 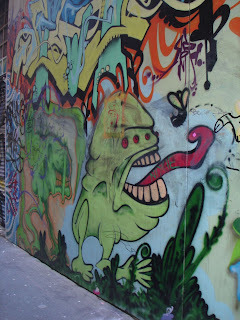 Nothing is spared the piercingly perceptive eye of the alley and rooftop artist.